Being already one of the premier PC makers, it was only logical for Lenovo to take a shot at the quickly expanding market for Android tablets. This summer, the Chinese manufacturer released three different models, which include the IdeaPad K1, ThinkPad and IdeaPad A1, in an attempt to offer a droid tablet for every taste and budget. We managed to spend some quality time with the entire lineup of Lenovo slates, running the Google OS at an event in New York, and here are some fresh initial impressions for you. We will begin with the Android Honeycomb 3.1 running Lenovo IdeaPad K1. The 10″ tablet sits right in the middle of the Lenovo lineup of droids, and is expected to compete with the offerings from ASUS, Acer, and Toshiba. The IdeaPad K1 is powered by a dual-core NVIDIA Tegra CPU, and comes with a gig of RAM on board. The internal memory of the tablet varies between 16 and 64GB, and can be further expandable via a microSD card. Full connectivity suite is available, including optional 3G support. The tablet has a 5MP camera on its back, along with a 2MP front-facing snapper. Its 10″ screen has 1280×800 pixels resolution. The IdeaPad K1 weighs 1.7 lbs, and has 10 hours of battery life. Software wise, you get Android Honeycomb 3.1, which has been slightly tweaked by Lenovo with a launcher on the homescreen, and a proprietary app store, offering apps which have been tested for compatibility with the tablet. Bearing that in mind, as far as specs are concerned, most Android Honeycomb tablets come quite close, we believe it’s factors such as design and build quality, which are crucial for the success of any of them. In this aspect, the Lenovo IdeaPad K1, much like the other products from the Chinese company, gets a high score. The build quality of the tablet is superb. The back is made from textured plastic with a pleasant feel and prevents the slate from easily slipping from your grip. The Lenovo IdeaPad K1 from Lenovo is currently available with prices starting at $449 for the 16GB, Wi-Fi only version. Like we already mentioned above, if you like the looks of the device, it is certainly worth attention. The next object of our attention is the Lenovo ThinkPad tablet. The device is an extension of the highly popular line of business oriented laptops, which can be traced all the way back to the times, when they carried an IBM logo. Just a brief look at the ThinkPad can tell you that the tablet means business. It shares most of its internals with the IdeaPad, but there have been a few major additions, which bring it up to par with its laptop cousins. Among them are a full USB port, 3 in 1 card reader, and data encryption. Software wise, along with Android Honeycomb 3.1, the slate comes with a serous number of productivity apps preloaded such as Documents to Go, Printer Share and Citrix Receiver. The latter allows you access to your Microsoft Windows running desktop in the office. Battery life is claimed at 8 hours with Wi-Fi turned on. The Lenovo ThinkPad droid comes with a tablet pen which, with the help of software, transforms your hand-written notes into digital text. As an option, you can also purchase the keyboard dock, which has the exactly same design as the ThinkPad notebooks, including the signature red mouse bud. By far, we dare to say, the Lenovo ThinkPad is one of the best Android tablets on the market. With a superb build quality, a number of options which are not offered by the competition, and a starting price of $499.99 for the entry level, 16GB version with Wi-Fi, the tablet brings its game closer to full blown personal computer than any of its rivals. The last tablet offering from Lenovo which we encountered, was the recently announced, 7″ IdeaPad A1. Priced at the highly affordable $199.99, the Android 2.3 Gingerbread offering is aimed to compete mostly with the dedicated e-book readers out there. The IdeaPad A1 runs on a single-core Cortex-A8 processor, clocked at 1GHz. Its 7″ screen comes with a 1024 x 600 pixels resolution. The entry model comes with 8GB of on board memory, which goes up to 32GB. A microSD card slot is available for further expansion. There is a 3MP camera on the back, along with a VGA unit for video calls in the front. Full connectivity is on board sans 3G. The latter will not be available as an option. All this functionality comes in a package which is only 10.1mm thin, and weighs 400 grams. In our brief encounter with the budget tablet, we found it feeling a lot more upscale than its price tag suggests. We attribute this fact to the high quality materials used by Lenovo. Given that the price is marginally higher than what basic e-book readers command, we believe that the Lenovo IdeaPad A1 is a viable alternative to them. 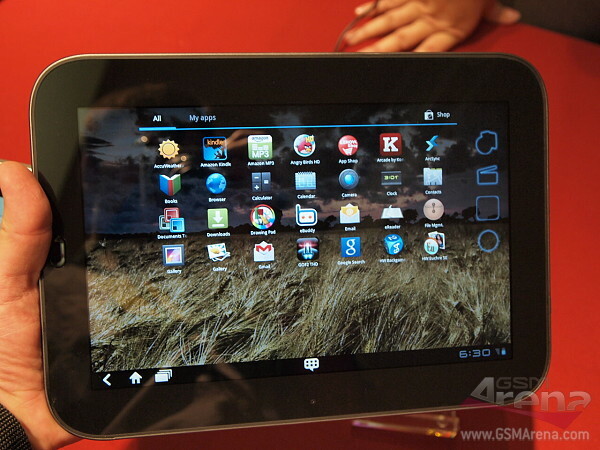 We do look forward to spending more time with the Lenovo Android tablets. Our first impressions were quite positive across the entire range. In the meantime, feel free to tell us which one do you like the most in the comments section below.